Topics: Pricing, Fully Guaranteed, and Drain Jetting Clearance. 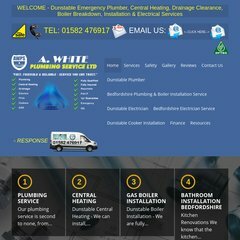 a-white-plumbing-servi.. Watford, Hemel Hempstead, St Albans, High Wycombe Plumber. The programming language environment is PHP/4.4.9. ns34.1and1.co.uk, and ns33.1and1.co.uk are its DNS Nameservers. 1 1 Internet Ag Baden-wurttemberg is the location of the Apache server. PING www. (82.165.53.19) 56(84) bytes of data.